Want to have a silky skin after showering? Go nuts with this 100% natural Nutty CocoNutty Body Scrub. Due to the moisturizing properties of organic coconut oil (cold pressed), your skin will feel moisturized, smooth and silky after showering. There are only natural ingredients in the scrub. Dead skin cells are removed, while your skin is simultaneously fed by the deeply moisturizing properties of organic coconut oil (cold pressed). The addition of a little lavender creates a soothing and relaxing effect. 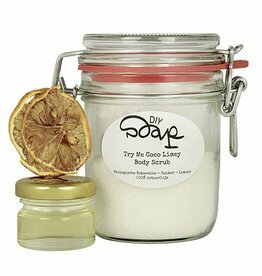 This Body Scrub is suitable for all skin types. 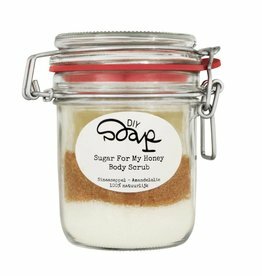 The scrub is easy and quick to make, it comes in a beautiful glass-preserving jar. Usage: 1 x weekly body scrub, use in the shower or bath. Make Scrub: 2 minutes. Requirements: microwave or stove, bowl, spoon. Caution: This scrub is hard because the coconut oil solidifies when it is cold. One solution is to warm up the scrub in the microwave before using or spoon the scrub out of the jar. Another solution is to make cubes. After preparation, pour the scrub immediately into ice cube trays and let the cubes harden. You scrub is then equally divided into convenient portions and it also looks nice! Store the cubes in the preserving jar and use 1x block per week to scrub! How do I make Nutty Coconutty Body Scrub? - Heat the coconut oil. - Pour the melted coconut oil in preserving jar with the sugar and add the lavender oil. - After preparation 6 months. - The tray where coconut oil is made from corn plastic and 100% compostable. Caster sugar, extra virgin coconut oil *, essential oil of lavender (Lavandula angustifolia oil).